The Deanwood Groups - Want to join one or start one? 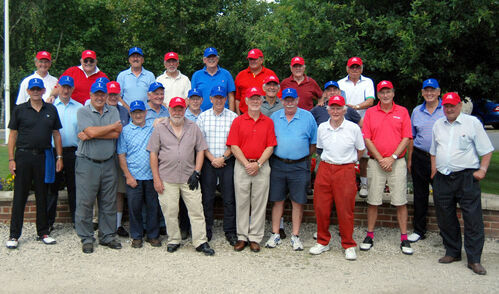 Deanwood has always been a very sociable club and a great place to meet new people. We have many groups that have and continue to spring up creating opportunities for others to join in or to take ideas from for their own groups. If you have a group and would like somewhere regular to meet and play that is convenient and in excellent condition all year round then contact Deanwood. Our 9 holes are easy to fit in after work, or at weekends when you don't all have the time to play a long 18 hole course. For regular groups not only can Deanwood offer a preferrential green fee rate, but can offer to organise competitions and social events for your group. Bigger groups may also qualify for free prizes from the shop for competitions! Handicap administration is also available at no extra charge. Some groups at Deanwood are "closed groups" that are not open for others to join in with, but we have some "open groups" that may appeal to you and you are able to join in with. Below are some of our groups and those that are open have that status indicated along with contact details for the group administrator or how or join in. The GODS meet on Saturdays and play 18 holes starting between 12-12.30pm. Most are Premier members, but that is not a requirement and all are welcome. Each week costs £5 with prize money given for front nine, back nine and overall as well as '2s'. Handicaps are adjusted by the group admins and fines are also levied following each game. The Deanwood Ladies have a roll up session every Tuesday & Thursday morning at 10am that is open to all lady golfers of any ability. Some ladies play 9 holes, some 18 holes and some enter the club competitions. Other social events occur within the group from time to time and group tuition is also organised with our Professional Nigel Hart. The Seniors is one of our largest groups who meet on Friday mornings at 8am. There is always some type of competition to get involved in or just enjoy a sociable morning at the club. Always looking for new members of the group they would welcome all abilities, but a handicap is needed for the competitions. An open group, predominantly but not exclusively members who play 9 holes on a Thursday evening. Call Lewis Carver on 07703033985.